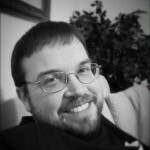 This is a guest post by Dan Neagoy @ThetaTrend. 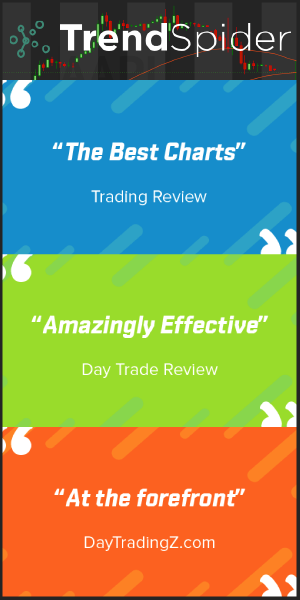 Dan is the founder of Theta Trend a site devoted to helping retail traders become consistently profitable options income traders. One of the biggest challenges newer traders face is finding a style that “feels right.” For many traders, the process can take a while to sort out and seem discouraging at times. 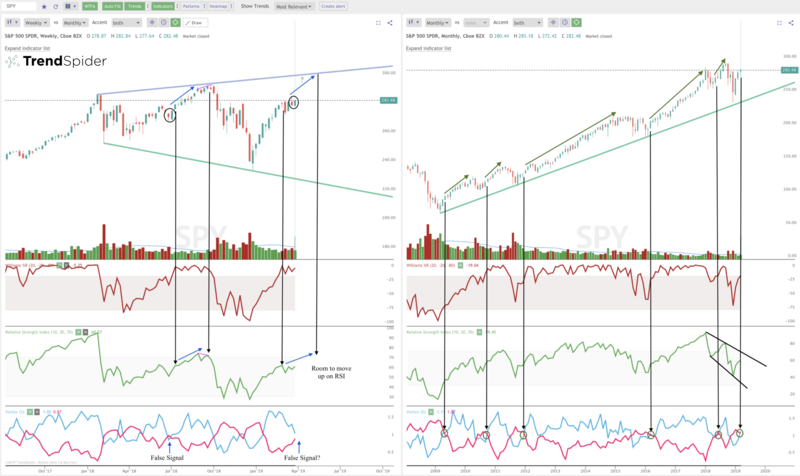 A common progression is choosing a style and then looking for different markets or stocks to trade. For example, a swing trader might look for stocks that are getting ready to pop higher or sell off for opportunities to get long or short. Options Income traders do things a little differently. Rather than finding the right setup, options traders generally modify their strategies as the market moves. Instead of making money if the market moves in the right direction, many options traders attempt to make money over a range of prices and even if price stays the same. If you get frustrated trying to pick market direction and think all that “cup and handle/head and shoulders” analysis is nonsense, you just might be an options trader and don’t know it yet. Options Traders are frequently poor market timers and prefer to bet on the probability of something not happening. The benefit of selling options intelligently and with proper risk management is that the positions have the potential to make money even if you’re wrong about market direction. You don’t need to hunt for stocks on the move and can trade the same, highly liquid market(s) every month. 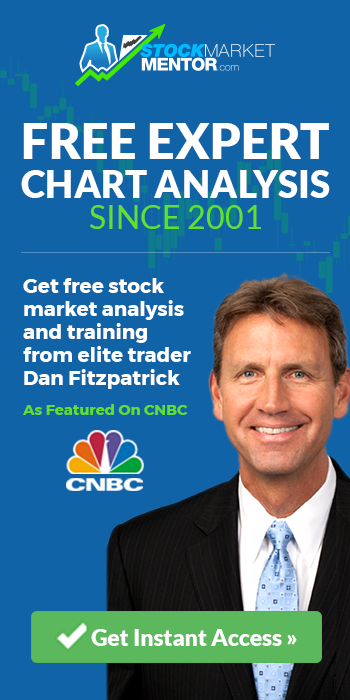 Many income traders only trade the S&P 500, Russell 2000, and Nasdaq. Use the same strategy or handful of strategies regardless of what the market is doing. Instead of looking for a new market you can adjust or change the strategy when the market moves against the position. 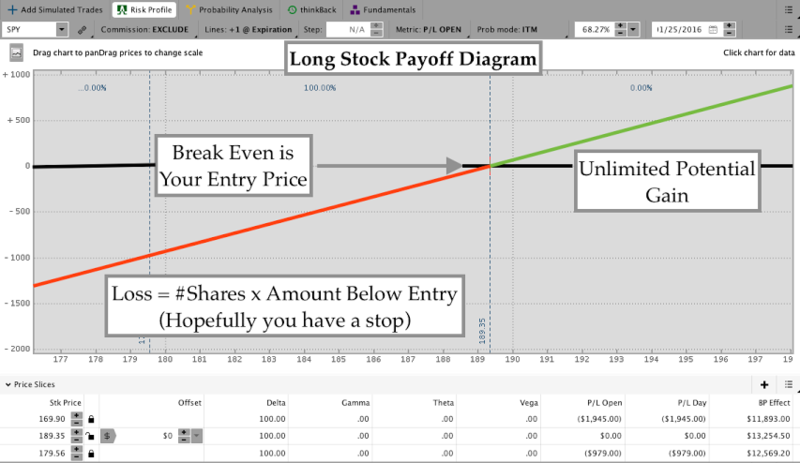 Make money over a range of prices rather than from “Point A to Point B” or until a stop is hit. Options strategies frequently have a high win rate. It’s not uncommon for options income strategies to have win rates in excess of 75%. 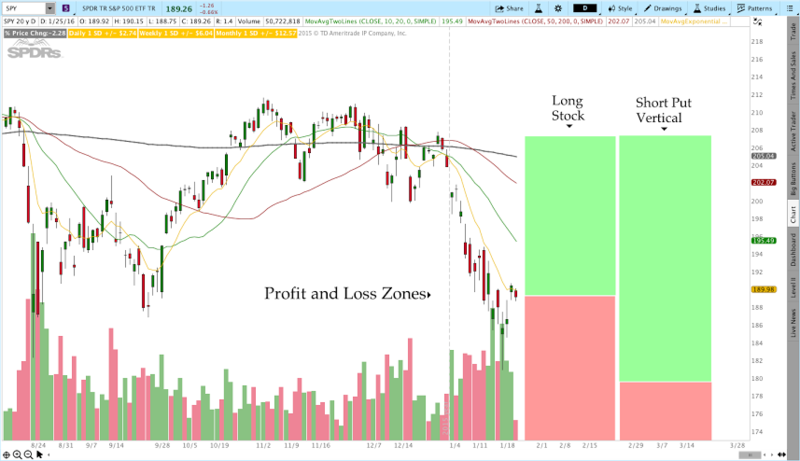 To illustrate how an options trade can make money even if you’re wrong about direction, we’ll look at a sample long setup. The trade below compares buying 100 shares of the S&P 500 ETF (SPY) to selling a put vertical spread. A put vertical spread is similar to selling a put option, but has another long option to cap the maximum risk. The main benefit of selling an out of the money vertical spread is that the options decay over time. As a result, the position can make money if the market moves higher, stays the same, or doesn’t go against the position too much. This is where things get more interesting. If we sell an out of the money Put Vertical Spread, we can make money if price moves higher, stays the same, or even declines a bit. The payoff diagram below illustrates a short put credit spread. This particular spread sells the 180 strike SPY put and buys a 178 strike Put. 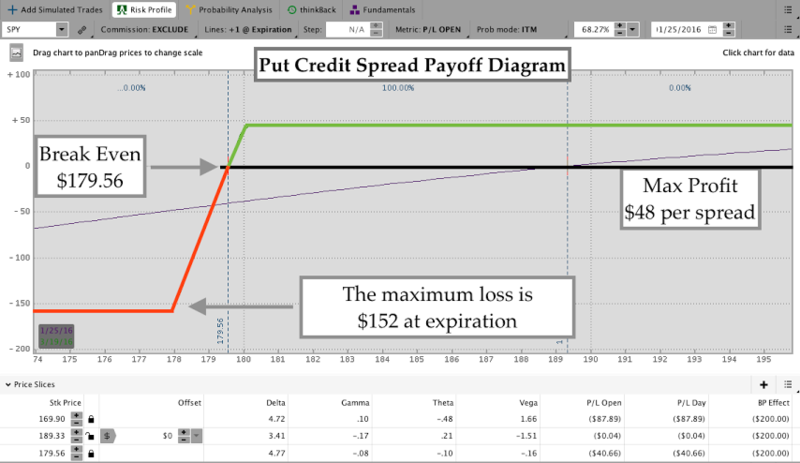 The spread can be sold for a $48 credit and has a maximum risk of $152. 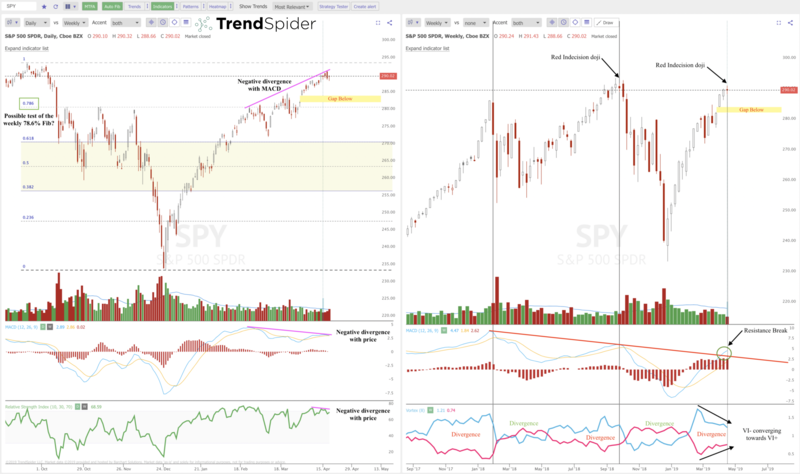 The trade will make money as long as SPY is above 179.56 at options expiration. In other words, the trade has a roughly 10 point buffer over the long stock position. The real difference between the two trades is the range of profit. When we buy stock, we know the position will lose money if the market trades below our entry price. When we sell a vertical spread, we end up with a break even point that can be well below the current market price at expiration. The break even point of 179.56 on the Put Credit Spread illustrates why people sell options instead of attempting to time the market. For the long stock trade, the break even point is the entry price or 189.35. An options trader might evaluate the market and choose to sell a put spread because they believe the market won’t go significantly lower. They might also reason that the market could go a little bit lower, but probably won’t make a new low. In other words, many options traders prefer to think about where the market won’t go rather than where it might go. Trading options and especially selling options is not without risk. Even though the strategies have high win rates, poor risk management will lead to significant losses. In the put vertical we looked at above, the potential payoff is much less than the maximum loss. Due to that risk:reward, most options traders do not take the full maximum loss on their positions and choose to hedge, adjust, or simply exit the trades. Good risk management is important for all traders and it’s especially important for options sellers because the maximum profit is limited. That being said, if you control your risk, selling options can provide a much wider range of profit with a high probability of success. 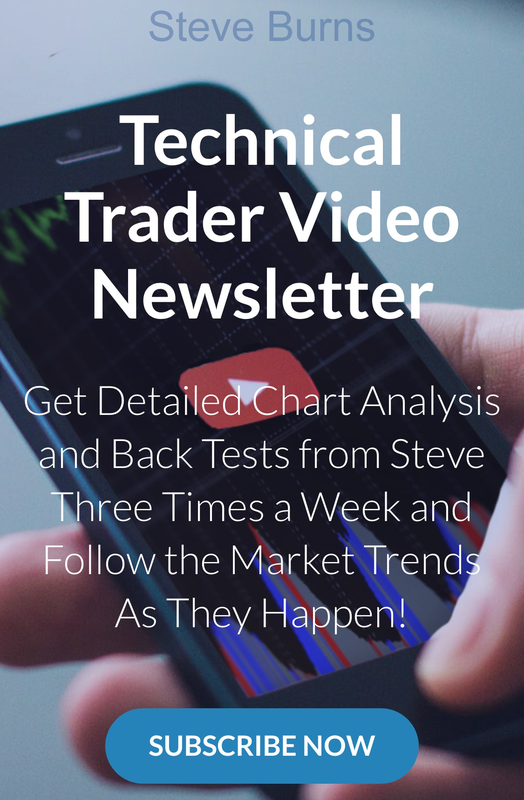 To see a sample trading system that sells Credit Spreads using an objective trend filter, click here .The system includes entry and exit rules, markets to trade, and a comprehensive discussion on managing risk and expectancy. Do Buyers Of Options Benefit From High Volatility?